Bright and early 8am on the bus, off to visit some more great wineries! 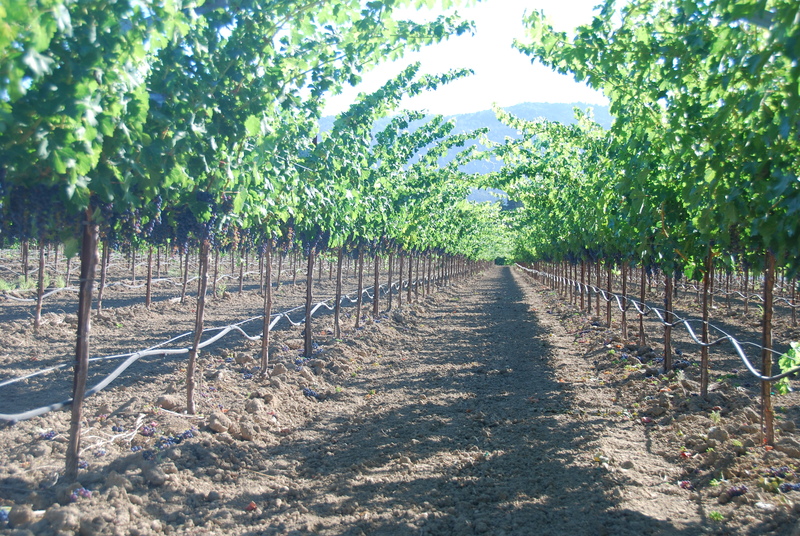 Today’s agenda: Barnett Vineyard & Philip Togni Vineyard on top of Spring Mountain, lunch at Moone Tsai in Coombsville, Piña in Oakville, Salvestrin Winery in St Helena and dinner at Amici Cellars in Calistoga. A very promising day! Barnett Vineyards was the first stop, at the very top of Spring Mountain. It was a beautiful morning with stunning views of the valley floor. Usually there is a fog bank that we would be above from there but this morning we missed it. We didn’t miss the great wines though. We tasted Chardonnay from the Sangiacamo Vineyard, two Pinots, their Merlot, Spring Mountain Cabernet, and the superb Rattlesnake Vineyard Cabernet. David Tate was an outstanding host, sharing his story with us – he has traveled the world making wine from Australia to France, finally ending up here in California atop Spring Mountain. The tour of the caves was a real treat. Then we were off to the famous Philip Togni Vineyards. Philip and his daughter run the vineyards and make the wine. It is a tiny production annually with only 2000 cases produced using 100% estate grown fruit for all the wines. Philip is originally from England and did a lot of wine making in Bordeaux prior to coming to Napa. 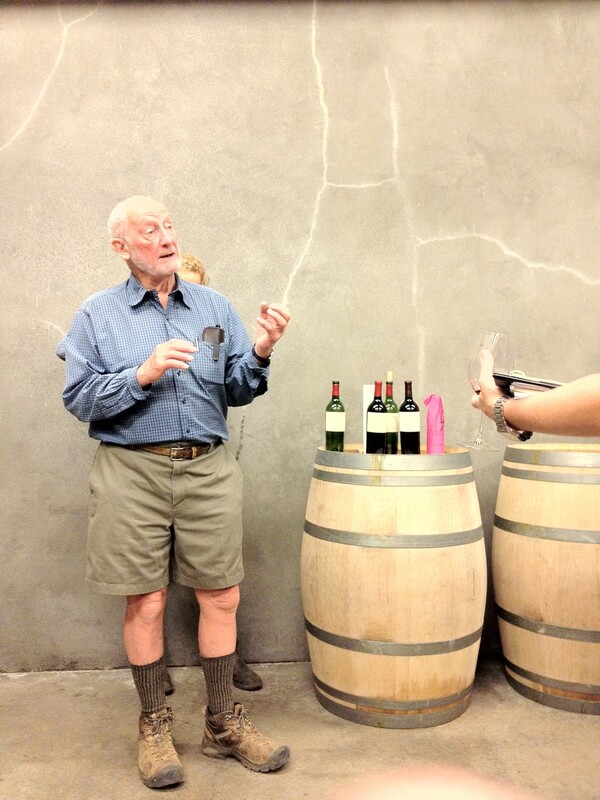 He’s a bit of a legend in that he was the first winemaker for Chappellet in the late 60’s. We had the opportunity to taste four wines – three of the top tier Philip Togni label, 2008, 2005 and1998. The 1998 was a stunner! This was considered a poor year for California but at 14 years old this wine is just hitting stride. Their dessert wine Ca’Togni was outstanding as well. The trek to Moone Tsai Vineyards in the Coombsville area was a fun one! We took a little detour along the way because our directions to this very remote spot got us a little lost. We took a right and ended up a private driveway. Let me tell you, turning around a 30+ person bus on a one lane road was entertaining. Then a guy we didn’t know showed up on his 4-wheeler shaking his head and asked what we were thinking. The man turned out to be John Caldwell of Caldwell Vineyard! He was hosting us and guided us to the correct driveway, down to the caves where we had lunch. This lunch was no ordinary lunch. We started off with lobster risotto, then onto local grilled vegetables and balsamic glazed butterflied leg of lamb and roasted ribeye, ALL paired with different Moone Tsai wines. As if that wasn’t enough, we had an amazing guest, Philippe Melka! For those that don’t know who he is, I’m sorry, you should do some research. Go buy a bottle of Moone Tsai as your first piece of research! Philippe is one of the greatest winemakers in Napa Valley. I had the opportunity to sit next to him during lunch and he is a really down to earth guy. Our hosts were no less than spectacular – Larry and Mary Ann Tsai were perfect. Their passion for their wine and the business we share together was humbling. Of course, John Caldwell was colorful throughout the visit. He is truly one of the great grape growers in the Napa Valley and wines were OUTSTANDING! We were then off to Piña Vineyards in Oakville. Our group was late due to our little detour on the way to Moone Tsai and when we called to tell them that we were a little behind, they just laughed and said that they’d see us soon. Right on the Silverado trail on the valley floor is this small, family run business of four brothers. We had the opportunity to taste through their wines; the D’Adamo Vineyard Cabernets from both 2007 & 2008 were outstanding. 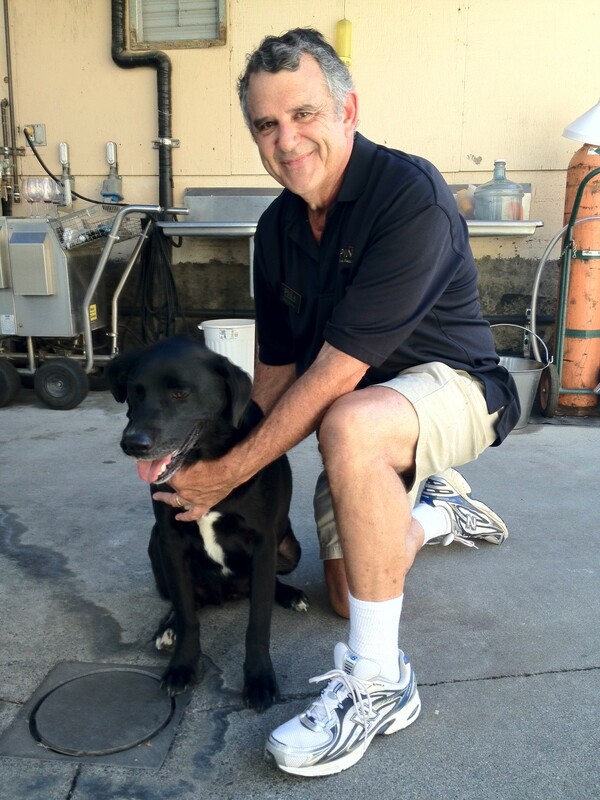 Yogi, the winery dog was particularly friendly and a good host as well. Salvestrin Winery was next on our travels, right off of Hwy 29 in St Helena. As the food coma wore off, we stepped off the bus and were greeted with a glass of Sauvignon Blanc. It was a very hot day but, we still braved the vineyards to learn what makes Salvestrin special. Their vineyards are actually quite famous. They are part of the original Dr. Crane vineyards. In fact, their home was Dr. Crane’s! They had some really great wines. The Estate Cabernet Sauvignon was outstanding and the Cult Cabernet was definitely one of the greatest values produced in Napa Valley. Stop 6 of the day, and the last stop on Day 3, was to Amici Cellars in Calistoga. It was nothing less than amazing. 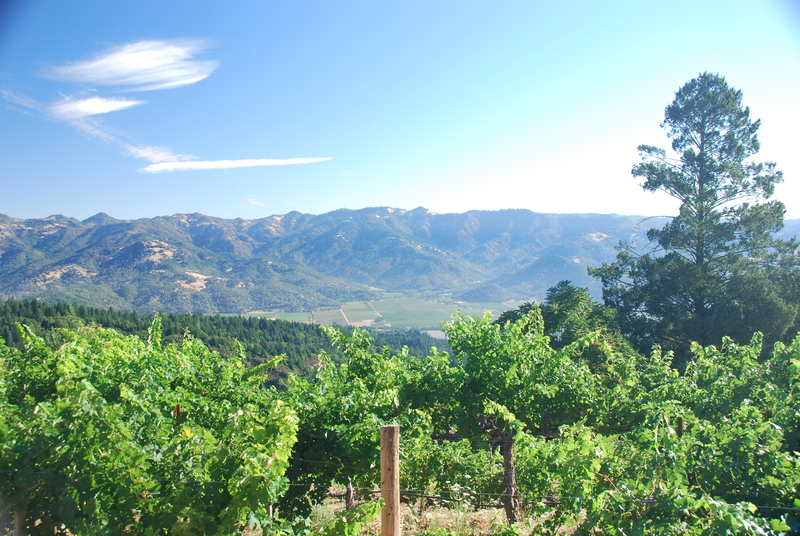 The winery is just above Jericho Canyon on the eastern side of the valley at the foot of Mt St Helena. Greeted by the owners and their children there couldn’t have been a better place to end the day. 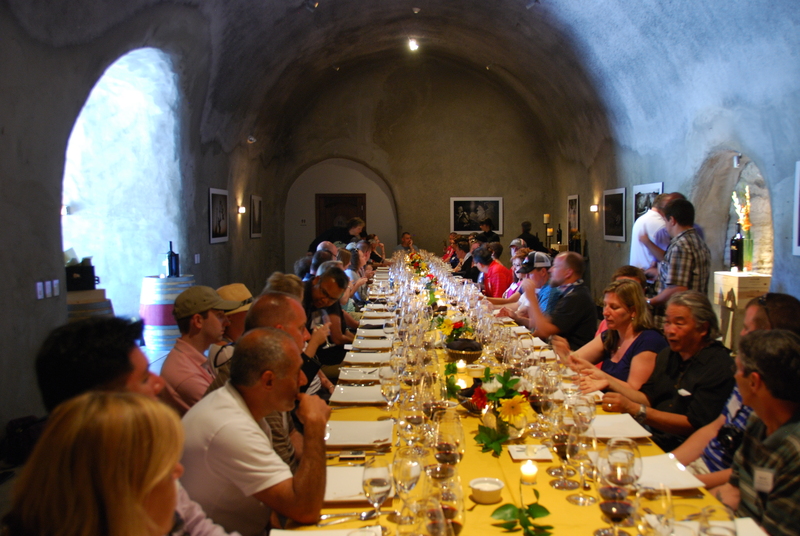 We started off with a little Sauvignon Blanc and then went into the caves for a rigorous tasting. 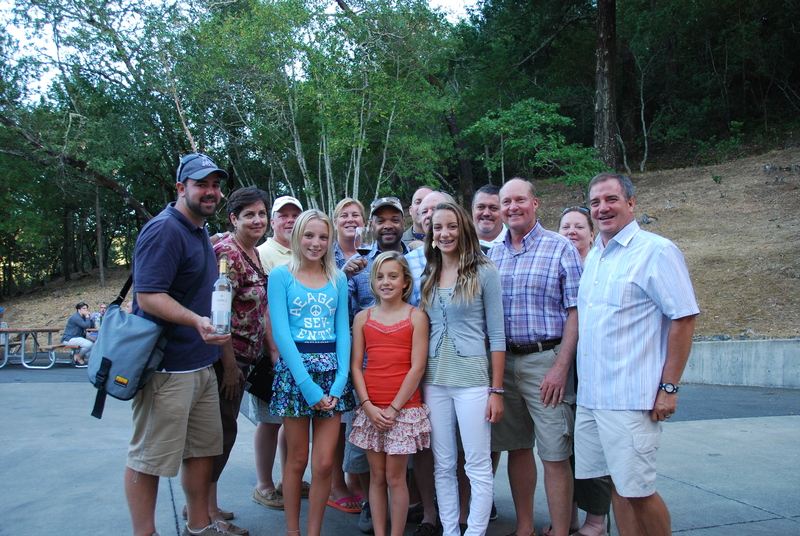 These folks also make the Olema line of wines which we tasted through. There were a couple new wines that were absolutely STUNNING —a Spring Mountain Cabernet and Morisoli vineyard Rutherford Cabernet, both 2009’s. That Morisoli was something else. It was the most powerful and structured wine of the day. I’d have to call that a bruiser, something that strips the enamel off your teeth. I’m going to pick up a case when it hits the store in the fall. Sadly, there are not much of these to go around with both under 100 cases total production. Just when we though it couldn’t get any better, it did. We got to taste two samples of the Morisoli 2010, one from barrel and the other from tank. What a great experience. If you get the chance to do this at a winery, do it. It was really amazing tasting the difference between the two and then “blending” your own in the glass to taste the final product. Amici gets another paragraph just for the meal. What a spread they put on! 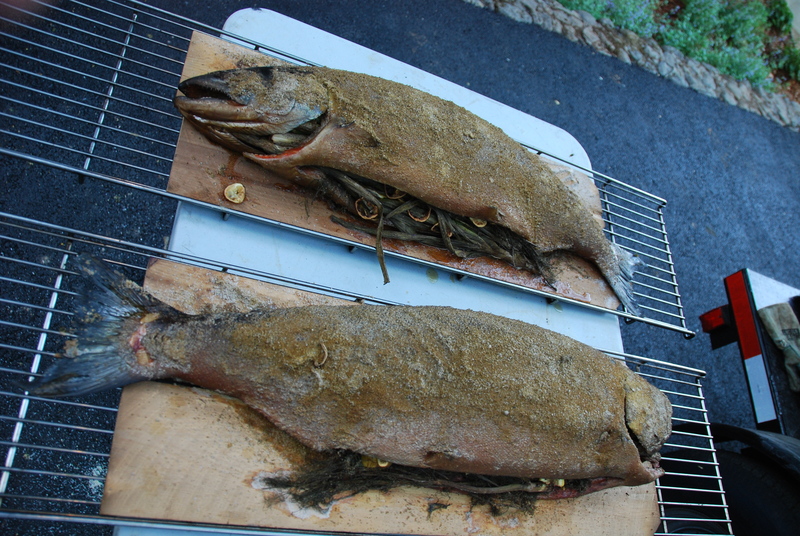 To start off, there were a variety of small hours d’ouvres that were all delicious, then first course was smoked leg of lamb pita’s and the main course was a whole 20lb salmon caught right off the Golden Gate Bridge in San Fransisco and smoked in a smoker that was the size of a small trailer. Lars from the Culinary Institute of America Greystone was our chef for the night, another true treat! Of course, there was copious wine available but there also was beer. Another day down, tomorrow more Napa! With the names you mentioned & most of the places you visited – considering you had a 30+ person bus??! – whoever was touring you has damn good connections.